In 1975 I was twenty-three years old and had never traveled beyond the borders of North America. Yet one day, I got it into my head that I wanted to tour Morocco. Long story short, a few months later my new husband and I were singing “Marrakesh Express” at the top of our lungs in a shiny blue Renault. 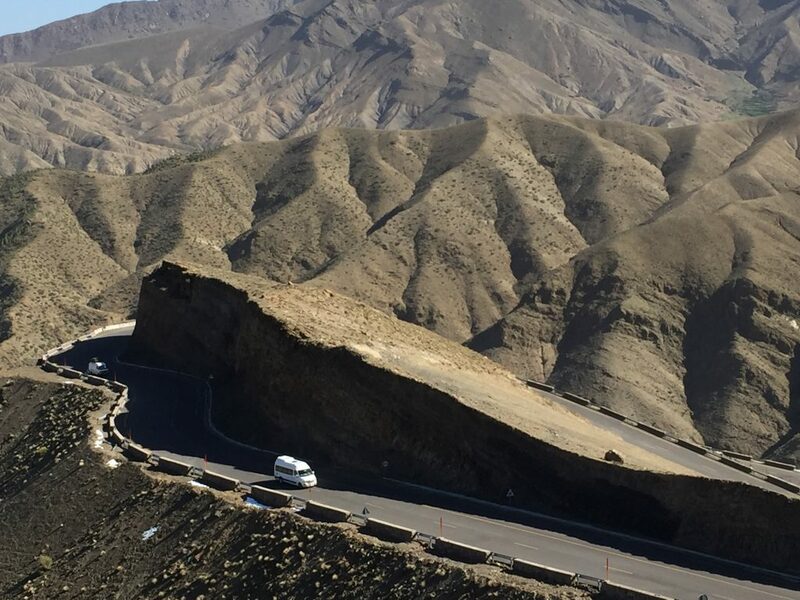 We were traversing the mountains and deserts of Morocco on a journey that would take us through Casablanca, Rabat, Meknes, and Fes along the undulating ribbon of freshly paved highway that connected them all to the oasis of Marrakesh. Fast forward. 2017. 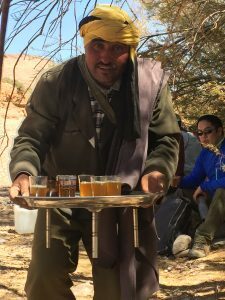 Intrepid Travel’s Walking With Berber Nomads trip appeared in my Facebook feed. Whoosh! Suddenly I could hear the muezzin’s call to prayer, smell the spices in the medina, and feel the breeze lifting my hair off the back of my neck on the Barbary Coast. I signed up the very next day. Well, you never forget your first time, right? I had thought of Morocco periodically over the years, and now I wanted to see if Morocco in the digital age had managed to remain the kind, eager-to-please country I remembered so vividly. This sign of hospitality on the outskirts of Fes remains my most enduring memory of 1975 Morocco. See the young man on the motor scooter in the distance? He offered—undoubtedly in the employ of the hotel—to lead us to a reasonably priced guesthouse, petite dejuener included. We followed, and it was lovely. Tiled floors and a balcony overlooking the city, upstairs from a French bakery. Merci beaucoup. At the time, Arabic and French were the prevalent languages. In those days before Trip Advisor, we traveled unencumbered by reviews. It may have been naive, but times were different. We never met another traveler on that trip, and once we were outside the cities, we never saw another car. No wonder Jimi Hendrix was hiding out there! We did chat with some Peace Corps volunteers in Rabat whom we recognized as Americans by the Clarks Wallabies on their feet. Early each day, with an Orangina in one hand and an open box of fresh croissants between us on the seat, I spread the road map on my lap as a napkin and off we went. In contrast to the few lodgings in 1975, today there are now over a thousand hotels of all sizes—mostly in the cities—in a country the size of California. 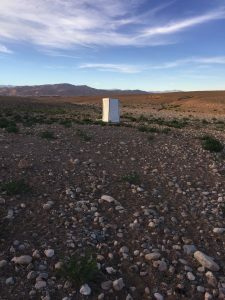 Frankly, other than these small differences, the countryside we experienced during our Walking With Berber Nomads trip remains very much the same beautiful, undeveloped landscape that I recall. 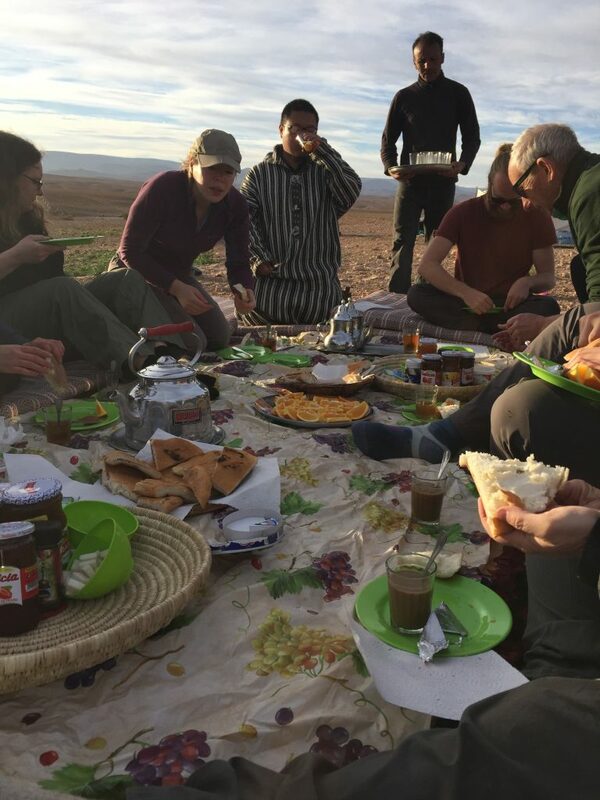 The twelve of us arrived from the US, Canada, UK, Germany and Australia to join Abdellah, our nomad guide, in Marrakesh. Most of the group were millennials, along with three 40ish, one 50ish, and me, the baby boomer senior citizen at 67. Abdellah briefed us on our trip details before dinner. We were the very first participants—the guinea pigs as it were—so flexibility was going to be our motto. The next morning we set out on the same switchback roads I recalled. 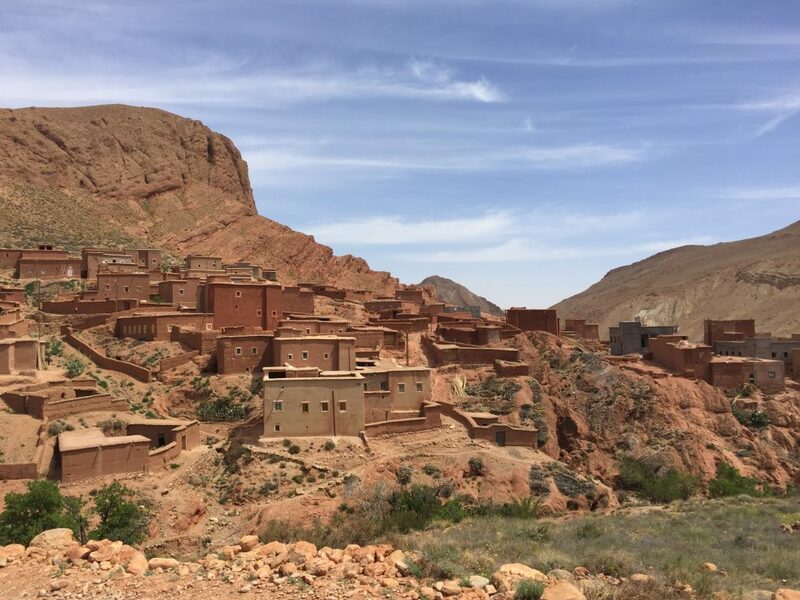 During the 7-hour drive from Marrakesh, we chatted, laughed, enjoyed the scenery, and bonded rather quickly with our shared love of traveling, hiking, and worldwide cultural experiences. 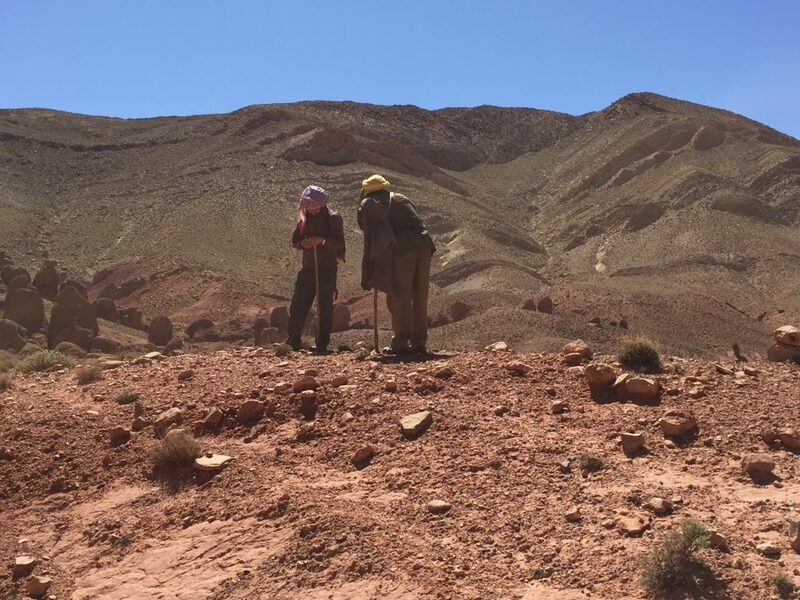 Soon we crossed the mineral-rich mountains of the Low Atlas and rolled off-road to the desolate location where we would join our Berber nomad family. It was springtime in Morocco. 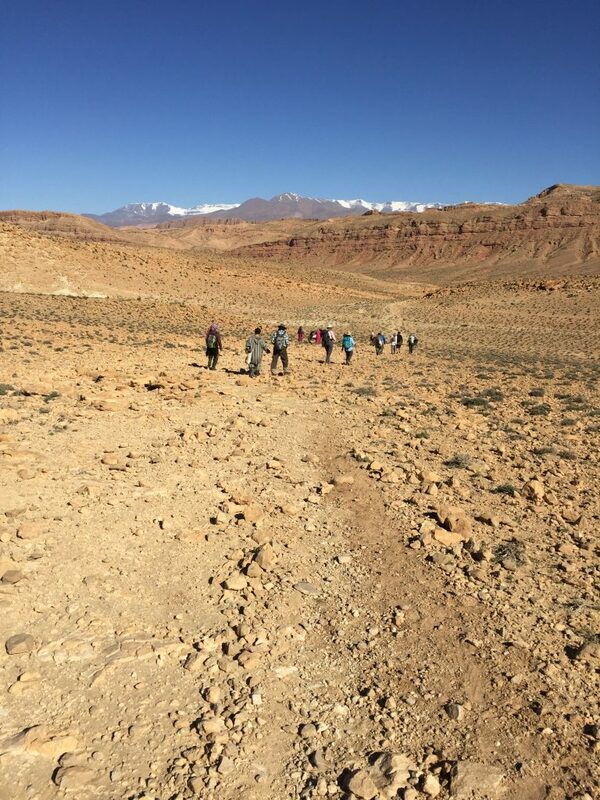 The nomads were ready to move their winter camp from the lowland desert to higher elevations for summer, and we would be hiking alongside, 9 to 15 km (6 to 10 miles) a day, an average of 4 to 5 hours a day on foot. 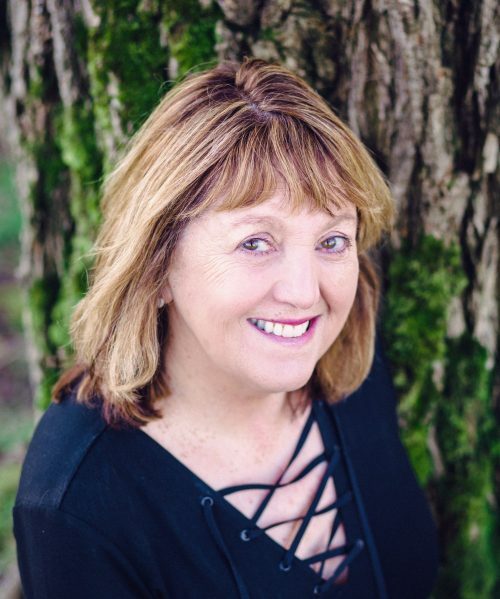 For three weeks prior, I had laid out my duffle contents on a coffee table back at home, adding and subtracting the vital and frivolous contents. 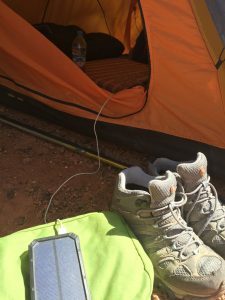 Most valuable items: broken-in hiking boots with wool socks, wet wipes, hand sanitizer, trekking poles, solar charger, journal. We each were allowed a duffle bag (40 lb/ 18 kg max) and had purchased drinking water along the way. There would be no water available for bathing or showers. 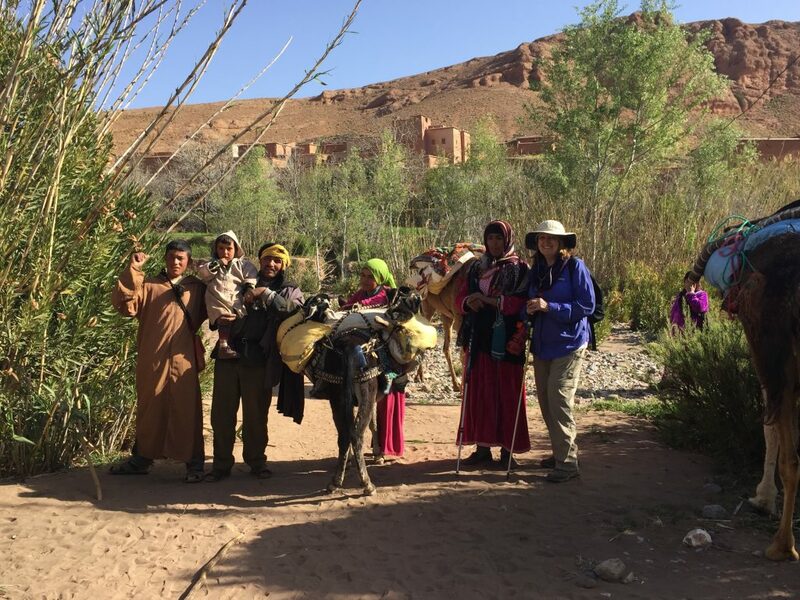 As we approached the Berber camp, our van drove ahead to drop off our gear, and we walked the final couple of miles to stretch our legs. 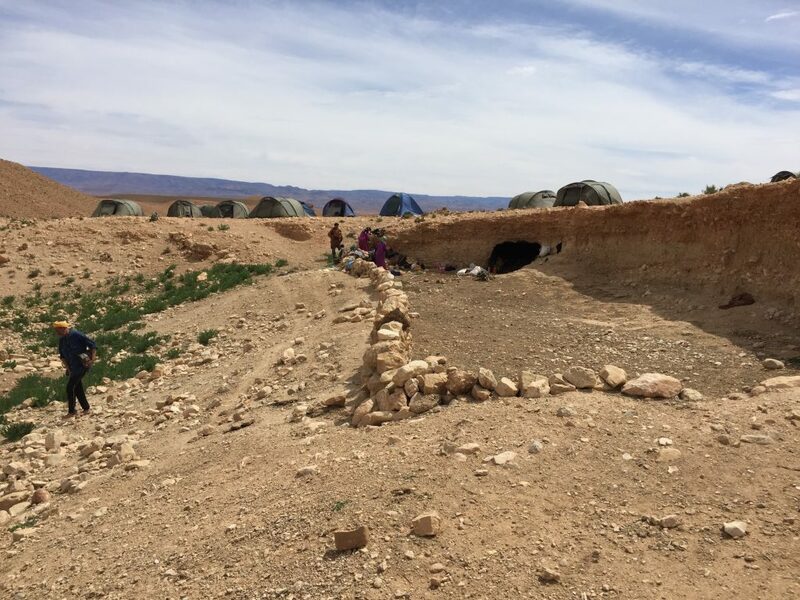 Our Berber nomad family was waiting for us across the plain at a location with smoke darkened caves that had been hand-carved into the banks by nomads hundreds of years ago. 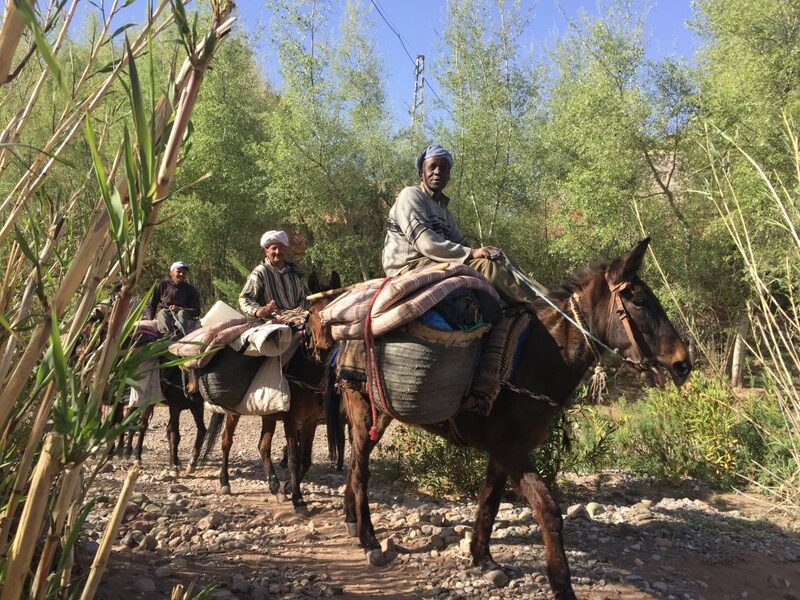 A cook, as well as a contracted team of three men to transport our tents and gear on mules, rounded out our group. 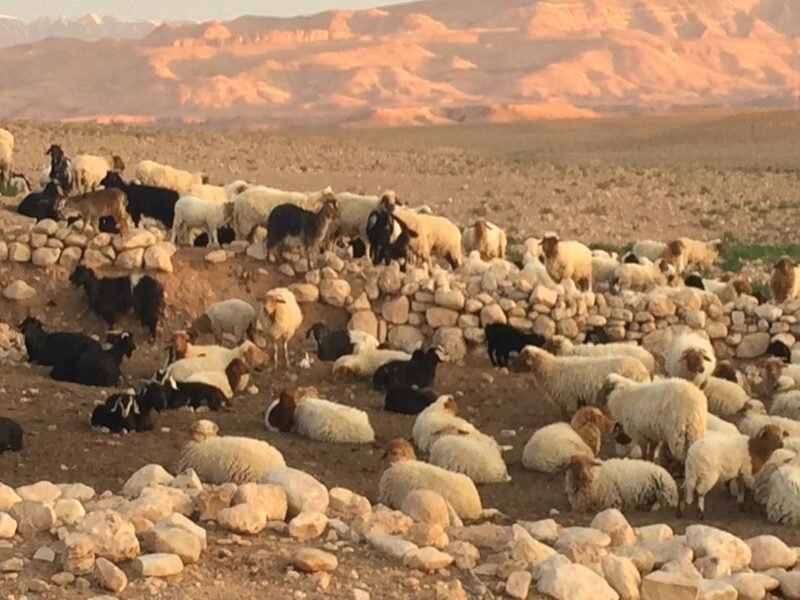 The animals consisted of 3 adult camels (1 of them very pregnant, and no—darn it—she didn’t give birth that week), 3 mules, 4 donkeys, 53 goats, 8 baby goats, 120 sheep, and 2 chickens. The baby goats tolerated being tucked into blanket pockets on the back of a donkey every morning with the two chickens decorating the top of the blanket pile like the bride and groom on a wedding cake. Day temperatures averaged low 80s F./ 26 C., and dropped to 40s F./4.5 C. at night. Not too hot, not too cold. “Just right,” said the baby bear. After dinner in the cave, we retired to our tents and fell asleep listening to the murmur of animals around us. I slept deeply in my silky long underwear with a change of clothes stuffed in the pillow shell of my sleeping bag. At dawn, we were awakened by a symphony of cellphones with a back-up chorus of goats and sheep. I hustled into my clothes, laced up my boots and sprang from my tent to greet the day. Watching the low rays of the sun swim over each hill until we were all bathed in its rosy warmth never got old. Breakfast: Mint tea, English breakfast tea, sweet Moroccan oranges, cheese, flatbread and jam. While we ate breakfast, the crew took down the cook tent, packed up, and set out ahead of us. As Karen Blixen’s houseman Farah had longed to do in Out of Africa, the mule team went ahead of us and prepared for our arrival. Each day had a similar routine, except for the days when they didn’t. Yes, pleasant surprises were frequent, but the common denominator was the same relaxed pattern. Rise and shine. Use privy, a hole dug in the ground with a canvas privacy stall around it. Pack up, take down tent, refill our water bottles. Hike for a couple of hours, enjoy a 15-minute break with a snack of tangerines, nuts and some bite-size cookies/biscuits like American animal crackers. Maybe some chocolate. Continue hiking to the night’s campsite. Enjoy the lunch that awaited us in a cave lined with rugs and our sleeping mats. tents or communally in a cave, write in our journals, or explore. Meet for dinner in a cave around an oil lantern. Share stories and comradery. Before or after dinner join the nomads in their singing, dancing and drumming. Day Two. The High Atlas before us. Seven hours. Crossing two valleys, countless ridges and a dry riverbed. 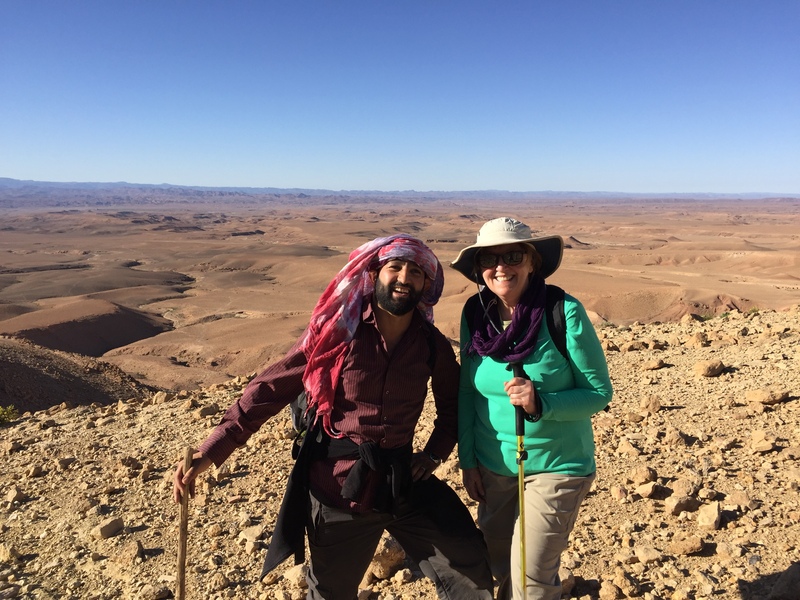 Abdellah and Linda Summersea pause at the first 1000′ climb in elevation. Low Atlas behind us, High Atlas ahead of us. Our guide Abdellah with a member of the nomad team. What did We Talk About on the Trail? Everything except politics. Exclamation Point. When you’re traveling with strangers, you don’t have the same reservations about being judged, so you tend be more frank. In the group, we rarely, I think, spoke about ourselves. This was about cultural immersion and we wanted to learn as much as we could about the nomadic lifestyle. For myself, I found that the conversations I had were about comparing travel destinations, discussing religious philosophy, and asking Abdellah questions about everything under the Moroccan sun: halal vs. non-halal, education, solar energy in Morocco, and more. 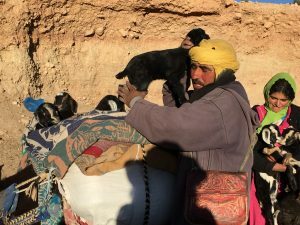 Abdellah frequently addressed us on topics related to our passage: farming, crops, exports, irrigation, the structure of village politics, cemeteries and burial customs—anything we saw that caught our interest. Other times, we walked along alone with our thoughts, the rhythm of our footsteps the only sound. After many miles, a village. 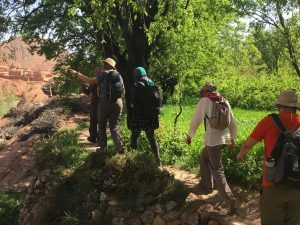 The nomads follow the old caravan routes, so our trek eventually brought us to some of the original 1000-year-old kasbahs (walled towns) in the mountains. The family herded the animals around their perimeter, while we passed through two villages. We saw the architecture and gardens up close, and stopped for tea at a B&B. As in Moroccan households, in camp, fresh mint tea was a ritual at every meal. 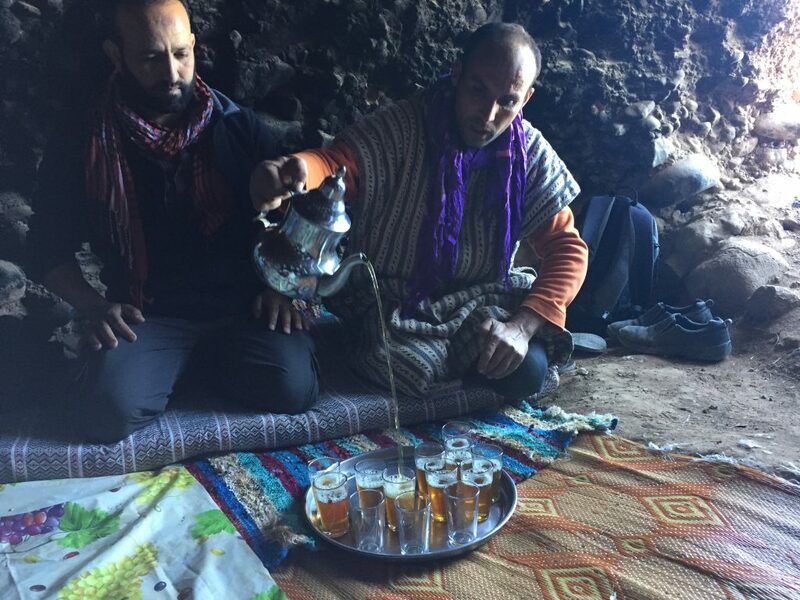 The silver teapot is held high while pouring into the traditional glasses with lots of Moroccan lump sugar. 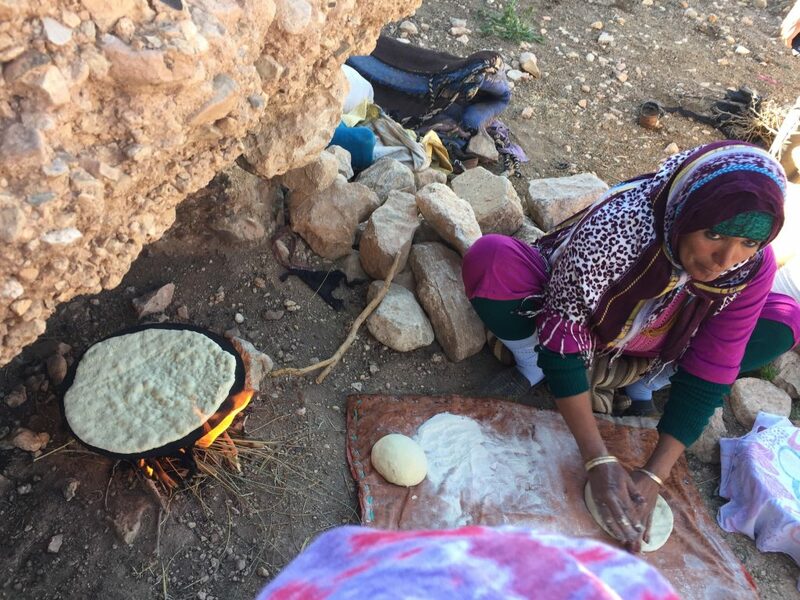 Fatima shared her daily tasks, teaching us a variety of skills from flatbread baking over the fire to goat milking at dawn. She even applied kohl to the eyes of our women and organized a mock wedding with the “bride” selected from our group and the cook serving as “groom”. The wedding took place on our final night in camp, a celebration that coincided with reaching the nomads’ summer location. There was a bridal procession with singing and dancing, and even “parents” of the bride and groom to demonstrate the details of a typical Berber nomad wedding. That night was our final night in camp. The following morning we expressed our heartfelt thanks to the family for being such kind hosts and so generous in sharing their culture with us. We passed along items from our gear that we thought they might be able to use. I contributed my trusty roll of duct tape. After many hugs and shukran’s (thank you’s), we reluctantly lifted our backpacks for our last hike as a group. Just before rounding a bend in the trail, I turned back for one last look at the scene of camp activity in the distance. Generations of nomads have repeated this tradition annually in the deserts and mountains of Morocco, but for how much longer, I wondered. Ahead of us, our van was waiting, ready to return us to the bustling streets of Marrakesh—and our first showers in a week. After we split up at the hotel, I spent a couple extra days unwinding in the city, eating ice cream, getting a hammam (traditional scrub-down, bath and massage), and exploring the Djemma el Fna Square to see how the cobra charmers were doing. Follow my adventures on Facebook.